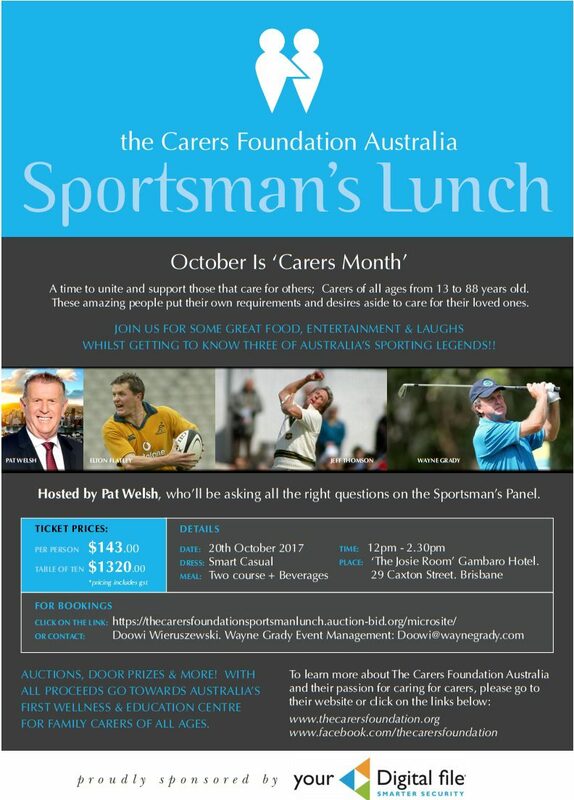 As part of Carers Month this year (October), we are holding a special fundraising luncheon in Brisbane, The Carers Foundation Australia Sportsman’s Lunch. 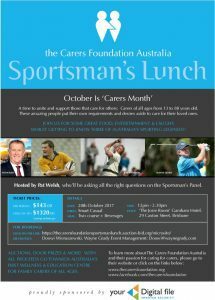 Proudly supported by Your Digital File, the luncheon is being put together for us by Wayne Grady Event Management and will feature world-famous sports figures including golf’s former PGA Champion, Wayne Grady, Queensland Reds and Qantas Wallabies player, Elton Flatley, and one of cricket’s greatest ever, Jeff Thomson. Tickets are strictly LIMITED and will sell out very quickly, so if you are keen to attend, grab your ticket(s) now!